The Museum of Latin American Art is an excellent small art museum located in the historic Balboa movie studio building in Long Beach, CA. It is one of the top specialty art museums in the Greater Los Angeles area and one of the Top Things to Do in Long Beach. It is the only US museum focusing exclusively on Latin American contemporary fine art. Although all the countries of Latin America are represented in the museum's collection, not all countries may be represented in every exhibit. In addition to the permanent collection, the museum hosts temporary exhibits focusing on specific themes or artists. From the outside, you might expect a lot more exhibit space, but the museum really only has two main galleries and a sculpture garden, with the rest of the building providing event space for performances, lectures and workshops. If you are not attending during a special event day, you can see the entire museum in an hour. MoLAA frequently hosts private events in the Sculpture Garden and other areas, which limits what you can see. Because the museum is small, you also may not want to visit while the temporary exhibit is being changed. Call before you go to make sure all exhibit areas are open. Admission: Check the website for current admission. Note: Group tours are available by appointment. There is an interactive audio tour you can access from your cell phone. The museum is located at the outer edge of the East Village Arts District in downtown Long Beach, a few blocks outside the more touristy area. There is a free parking lot, or it's 6 short blocks (12 minute walk) or a quick bus ride from the Metro Blue Line 5th Street Station. 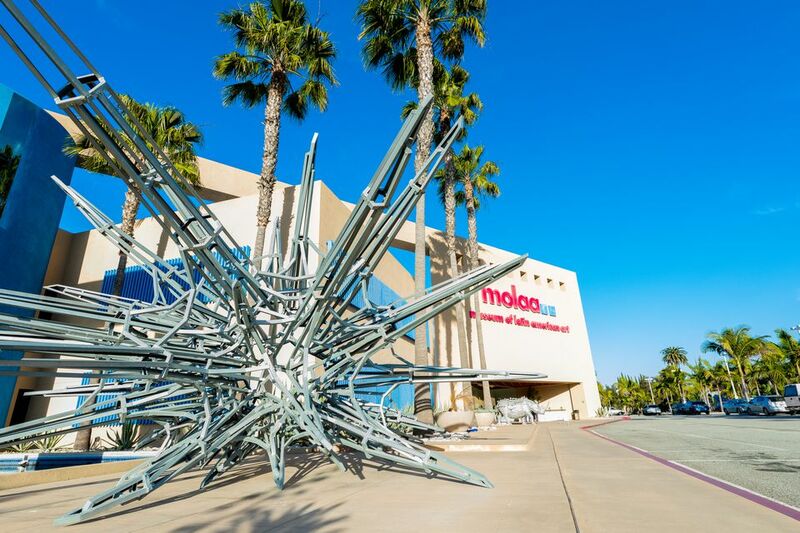 MoLAA was created in 1996 by Robert Gumbiner, MD, founder of the early HMO, FHP, using his private art collection, and a building that had recently housed the HMO's senior care services. The building began its life in 1913 as part of the Balboa Silent Movie Studios, which produced Fatty Arbuckle and Our Gang. After the studio closed in 1923, the major Art Deco building remaining was converted into a roller rink known as the Hippodrome. After WWII, the Hippodrome fizzled and the building sat empty until Gumbiner bought it and converted the front part of it into the FHP Senior Medical Center. The Medical Center included the Hippodrome Gallery, where patients could view art before or after their appointments. When Gumbiner retired from FHP, he created the Robert Gumbiner Foundation. He donated the majority of his personal art collection to the Foundation, which acquired the Hippodrome building in 1995 to create a home for the collection. Although the exterior of the building was completely revamped in 2007 when 25,000 square feet were added to the museum, the signature rectangular archway over the front of the building harkens back to the shape of the original Balboa Studios sign. Some of the original wooden flooring of the Hippodrome has been preserved behind the front desk and restored throughout the galleries. During a non-profit mission to Ecuador, Robert Gumbiner, already a collector of contemporary art, saw a painting in a private home that inspired him to visit the studio of artist Eduardo Kingman and acquire several pieces of his work. That was the beginning of what would become a very systematic acquisition strategy. Gumbiner traveled to every country in Latin America and sought out the most prominent and lesser known local artists to add to his collection. The museum holdings have continued to expand since Gumbiner's death in 2009, as exhibiting artists and other donors contribute pieces. There are over 1000 works in the collection, but there may only be 100 or so on exhibit at a particular time, since many of the paintings and sculptures are quite large and space is limited. Prominent artists include Uruguayan Cecilia Miguez, Brazilian Walter Goldfarb, Cuban José Bedia, Chilean Gonzalo Cienfuegos, Mexican Rufino Tamayo, Panamanian Guillermo Trujillo, Columbian Fernando Botero, Puerto Rican Paloma Todd, and Argentinian Antonio Segu. Exodo/Exodus by Mexican artist Arnold Belkin on exhibit at the Museum of Latin American Art in Long Beach, CA. Visitors with Marta Minujin's sculpture Pataia, made of painted plaster and styrofoam, at the Museum of Latin American Art in Long Beach, CA.